Time for Father's Day number two for the year! Lucky Kim gets to celebrate Father's Day twice a year. American Father's Day was back in June and now we have just had Australian Father's Day this weekend. Can you believe it's September already? Seeing as Kim has already been spoiled once this year with Father's Day treats we decided to keep it a little more low key this time around. No presents this time but we did come up with a cute card. You may recall that we attended our first baseball game a few weeks back. 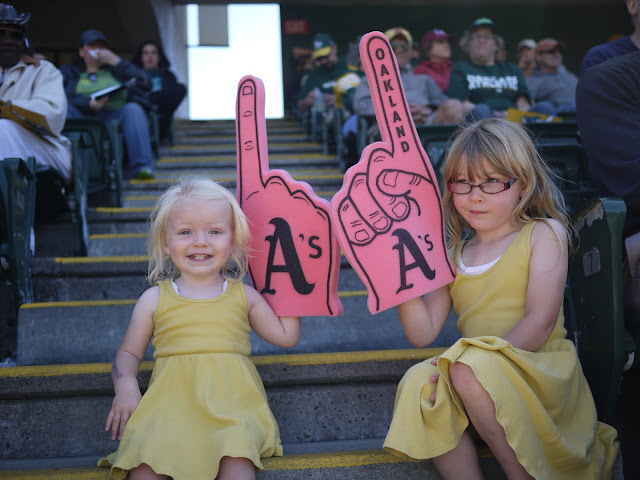 You may also recall that the girls were super excited to wear "baseball fingers". I thought that these two things would work nicely together for our Father's Day card. I'm always partial to a little cheesiness! 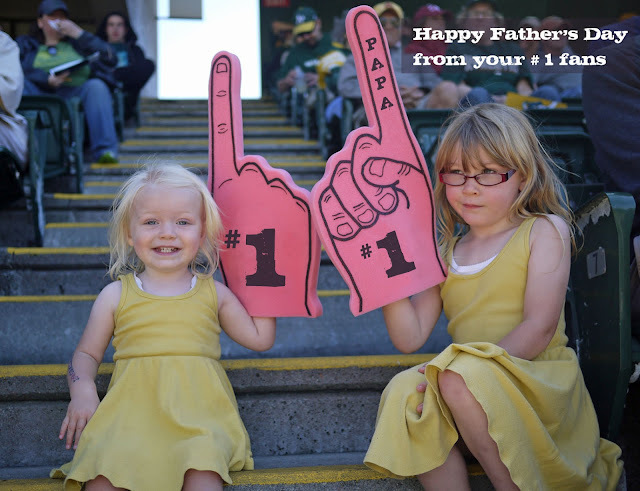 I took one of the photos from the game of the girls wearing their Oakland A's "baseball fingers", edited out the logo and text, added in my own details, added a cheesy greeting and voila, perfect Father's Day cards. I personalised them with the names Daddy, Papa (for my Dad) and Doug (for Kim's Dad - yes, the girls call him by his real name!). Hope all the Australian Dads out there had a happy Father's Day and were spoiled by their #1 fans!